A beautiful private modern beach house oasis with stunning sea views. 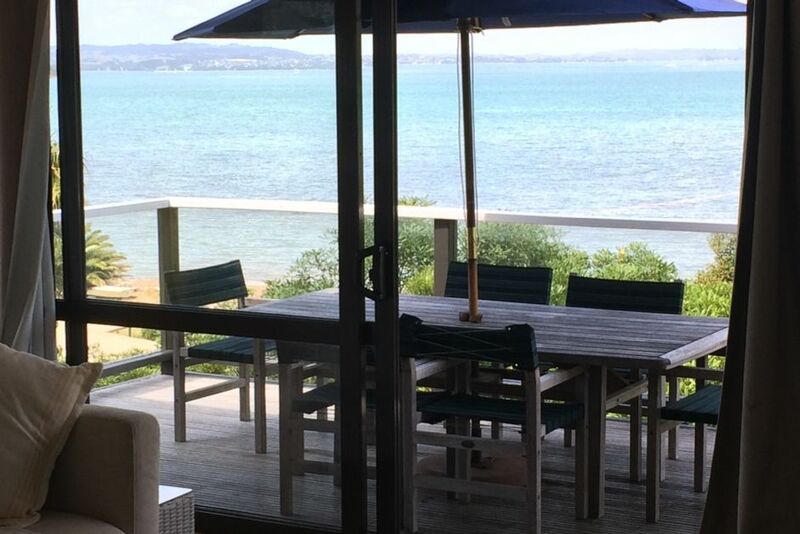 Come and enjoy what Waiheke Island has to offer in our modern beach home which overlooks Huruhi Bay in Blackpool. With two furnished decks for entertaining, only 100 metres to Blackpool beach. Inside you will enjoy all modern amenities with seaviews from the kitchen, living room and three of the four bedrooms. Heatpump from May 6th to keep you cosy. High quality cotton linen and bedding available. Separate laundry with washing machine, dryer and clothesline. Fully equipped entertainers kitchen including stone top island, modern oven, dishwasher, fridge and microwave. The living room opens out on to the front and back outdoor areas either overlooking Blackpool beach or secluded in privacy in a native setting. Includes gas BBQ, large outdoor table and chairs plus outdoor lounge seating. Waiheke's famous walkways are at your door step. Rent a bike, paddle board or kayak close by! *Access to the property is via a short walkway and offers ample street parking only. This property is not available for any parties, gatherings or functions unless prior arrangements are made with the owner. Comfortable stay for 6 adults. Easy distances to beach and village. Clean well equipped. All very happy with facilities. Clean and tidy. Sunny and warm. Well equipped kitchen. Close to beach and Oneroa village with good selection restaurants. Beds comfortable clean and warm. Loved the place and the views but a little bit of maintenance and cleaning ie. dusting etc skirting boards and toilets etc wouldn’t go amiss, especially as it’s not cheep to stay. We found the property to be an ideal for the 5 of us, within walking distance of a swimming beach and the town for shopping. The views are excellent over a bay. The swimming beach is a little further away. The house was comfortable with all the necessary facilities for a group or family. We had some issues with maintenance and these have been forwarded to the owner. Parking is not on the section but we were able to park on the road near the pathway. There is an excellent bus service for those without a car. There is an issue with mosquitoes during the summer so come prepared for being buzzed at night. Overall, our experience was favourable. We had a great time at this place, they have done a lovely job of renovating the Bach. Lots of places to relax indoor and out doors. A close walk to the main shops which was also great! Would definitely recommend this to people! Great location but overall disappointing. The place was not clean at all, we even spoke to cleaner as we left. The dishwasher was not working properly so all dishes in cupboards were still dirty. Beds not particularly comfortable and just overall shabby condition. Photos definitely make it look better than it is! Absolutely no safe parking near the property, long way to carry bags and supplies to get to property, so glad it wasn’t raining. Property is in need of lots of maintenance and a good clean. Door locks were knackered, had to leave unlocked when we went out. Positives were great views, peaceful, comfy beds and great showers. Yes the parking is on road, There is nothing we can do about this :) I have 3 young children and from my perspective its no problem. please understand that it is in the description of the property and the price you are paying is on the lower side for the size, location and desirability of the property for Waiheke.